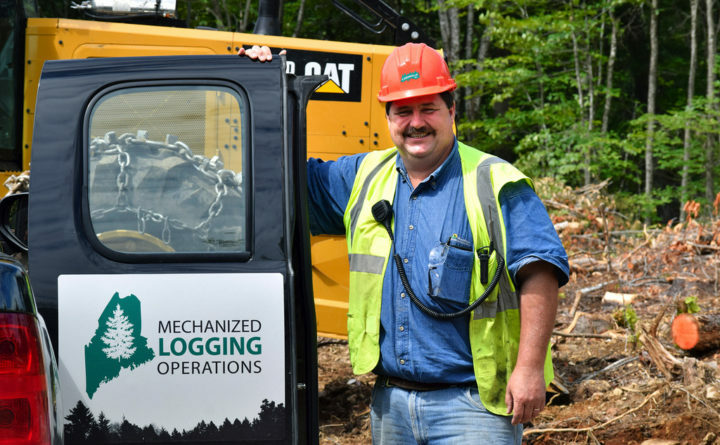 Donald Burr, Northern Maine Community College program coordinator for the new mechanized logging operations program, which began in August 2017 with eight students in Millinocket. Maine faces a shortage of loggers and log truckers that will worsen in the coming years, a study released Thursday found. The Pine Tree State’s labor shortage could stunt the growth of the $8.5 billion forest products industry, the study said. It honed in on the need to increase wages to attract workers so the industry can grow. The study, commissioned by the Professional Logging Contractors of Maine, was prepared by the Maine Center for Business and Economic Research at the University of Southern Maine. “The root of Maine’s vital forest products economy — the logging industry — must be able to offer higher wages to compete for existing workers and attract new ones at a time when they are desperately needed to support a resurgent forest products industry,” Dana Doran, executive director of the Professional Logging Contractors of Maine, said in a prepared statement. The study found that the core of the problem is profit margins for logging contractors, which have dwindled as costs of doing business have risen. That, in turn, has limited their ability to raise wages and and attract and keep workers. The average earnings for all employment in Maine’s logging industry have increased by 5 percent since 2010. That averages just more than $2,100 per worker compared to an average increase of $5,500 in comparative industries such as construction, wood manufacturing, and pulp and paper manufacturing. Average earnings in the logging industry peaked in 2015 and have fallen during the past several years, following a pattern of declining prices for wood fiber products delivered to mills in Maine, the report found. Contributing to the worker shortage is the more than 400 people in the industry who are at retirement age of 65 or older. Another 850 workers will reach retirement age within the next 10 years. The logging industry employed about 3,652 workers in 2018, down 9.4 percent since 2010. More than half the workers in the logging industry are equipment operators, such as loaders, yarders, skidders and delimber operators. They earn significantly lower wages than employees in similar production-oriented industries. Their median wage in 2018 was $16.47 per hour. The median hourly wage for truck drivers in 2017 was $15.23, again, among the lowest wage compared to other industries employing heavy truck drivers. Median wages for truck drivers in growing industries such as wholesalers like Walmart are $21.60. That makes it hard to find and keep truck drivers, the report said. The Maine Department of Labor projects an average of 984 annual openings for heavy truck drivers across all industries in the state, through 2026, due primarily to replacements of retiring workers and job exiters. Paper and forestry product companies have announced expansions starting in 2018 that will drive up demand for workers. They include the Verso mill in Jay, Nine Dragons mills in Rumford and Old Town, and Pleasant River, which collectively will add about 340 jobs at those facilities, putting more pressure on an industry with aging workers and low wages.